281 pages | 18 B/W Illus. The evidence is undeniable. By any measure, the US spends more on healthcare than any other country in the world, yet its health outcomes as measure by longevity are in the bottom half among developed countries, and its health-related quality of life has remained constant or declined since 1998. In addition to high costs and lower than expected outcomes, the healthcare delivery system is plagues by treatment delays as it can take weeks to see a specialist, and many people have limited or no access to care. Part of the challenge is that the healthcare delivery system is a large, complex, and sophisticated value creation chain. Successfully changing this highly interconnected system is difficult and time consuming because the underlying problems are hard to comprehend, the root causes are many, the solution is unclear, and the relationships among problems, causes, and solution are multifaceted. To address these issues, the book carefully explains the underlying problems, examines their root causes using information, data, and logic, and presents a comprehensive and integrated solution that addresses these causes. These three steps are the methodological backbone of this book. A solution depends on understanding and applying the principles of patient-centered care (PCC) and resource management. PCC puts patients, supported by their primary care physicians, back in the role as decision makers and depends on patients being responsible for their health including making good life-style choices. After all, the best way to reduce healthcare costs and increase quality of life is to improve our health and wellness and as a result need less care. In addition, health insurance must be rethought and redesigned so it is less likely to lead to overuse. For many people with health insurance, the out-of-pocket cost of healthcare are small, so healthcare decision making is often biased toward consumption. Effective resource management means that healthcare providers must do a better job of acquiring and using resources in order to provide care quickly, productively, and correctly. This means improving healthcare strategy and management, accelerating the use of information technology, making drug costs affordable and fair, reducing the incidence of malpractice, and rebuilding the provider network. In addition, implementation is difficult because there are many participants in the healthcare delivery value chain, such as physicians, nurses, and medical technicians, as well as many provider organizations, such as hospitals, clinics, physician offices, and labs. Further up the value chain there are pharmaceutical companies, equipment providers, and other suppliers. These participants have diverse and sometimes conflicting goals, but each must be willing to accept change and work in a coordinated manner to improve healthcare. To overcome these problems, strong national leadership is needed to get the attention and support from the people and organizations involved in healthcare and to make the comprehensive changes that will lower healthcare costs, improve healthcare quality, eliminate delays, increase access, and enhance patient satisfaction. "Mark and David present the key challenges facing the healthcare system and provide a comprehensive solution that is easy to understand for the general public, while challenging the status quo among healthcare leaders. The book is very timely given the disruptive changes taking place in healthcare and definitely contributes to the current discourse regarding our industry’s future!" "The book's patient-centered, resource management view of the U.S. healthcare system offers a unique perspective that will resonate with and generate fresh discussions among policy makers, health care payers, physician leaders and hospital executives alike. The book provides a fresh understanding of the healthcare delivery system that would be useful in healthcare-business academic degree programs as well as in educational sessions for healthcare managers and executives. This book motivates a new conversation, focused on a highly integrative, comprehensive approach to improving healthcare delivery." "A Healthcare Solution is a comprehensive and timely resource that is presented in a way that is understandable and engaging. The examples that are given are great insights into current healthcare problems and their root causes. The true intent of the authors is to improve health. Bravo." 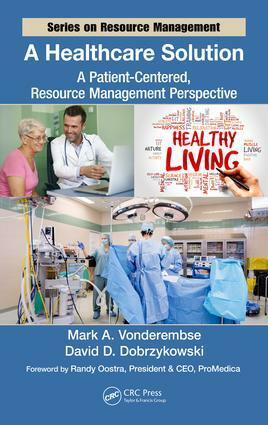 "Vonderembse and Dobrzykowski provide meaningful insight into the challenges we face with healthcare delivery and the solutions all stakeholders should reflect in our strategies and business models. This book should be mandatory reading for provider executives, supply chain leaders, product and services company representatives, and anyone involved with healthcare services – physicians, clinicians, providers, suppliers, consultants, and patients. It offers a comprehensive tool for helping us all achieve higher quality and more cost effective patient care and wellness." "Vondermbse and Dobrzykowski provide a future thinking, grounded, holistic approach to healthcare reform. A welcome addition to the healthcare leadership toolbox and a must-read." Healthcare: Where Do We Stand? Mark A. Vonderembse, PhD, is Professor Emeritus from the University of Toledo (UT) where he spent 38 years as a faculty member. He earned a Ph.D. in Business Administration from the University of Michigan in 1979, an MBA from the Wharton Graduate Division of the University of Pennsylvania in 1973, and a BS in Civil Engineering from UT in 1971. Mark has sixty refereed journal publications including thirteen in the Journal of Operations Management, which is widely regarded as the best journal in the field. He has also published in Management Science, Decision Sciences, International Journal of Production Research, European Journal of Operational Research, among others. He has more than 100 proceeding publications and has published three books and an annotated bibliography. He has nearly two dozen awards for research including Outstanding Researcher at UT. He has more than 40 research grant from various sources including the U.S. Department of Transportation, U.S. Department of Defense, and the National Science Foundation. He has garnered more than $4 million in grants as principal investigator and another $10 million as co-investigator. He has taught a wide variety of courses at the undergraduate, masters, and Ph.D. levels. He has taught in Germany, India, and China, and he has traveled internationally making presentations in China, Hong Kong, Japan, Korea, Singapore, India, Morocco, South Africa, Spain, England, Germany, Greece, and Canada. He has a strong track record in leadership. While at UT, he was the founding Director of the School for Healthcare Business Innovation and Excellence. He was Vice President, and ultimately President, of the Production Operations Management Society’s College of Healthcare Operations Management. He was also the founding director of UT’s Intermodal Transportation Institute. He was responsible for designing and building an institute that combined resources from four colleges within UT to address regional and national needs for research, education, and planning and technical assistance in the areas of transportation, supply chains, and logistics. He organized an Advisory Board of more the 40 members. He built coalitions with other universities in the region and received two designations as U.S. DOT University Transportation Centers. He was Director of UT’s Ph.D. program in Manufacturing and Technology Management for nine years, a program that he co-founded. He also served as Department Chair of Information Operations and Technology Management and of Finance for nine years. David D. Dobrzykowski served in a variety of management and leadership roles in the healthcare sector during a 12 year career with companies including Mercy Health (formerly Catholic Health Partners) and UnitedHealthcare. He has worked in hospital tertiary care, physician-hospital, diagnostic imaging, emergency department contract management, managed care, and employee benefits organizations. In the provider vertical, Dr. Dobrzykowski served as Regional CEO of BIDON Companies, a national diagnostic imaging provider, where he managed all aspects of operations including physician contracting, managed care contracting, medical billing, capital equipment purchasing, day-to-day operations (staff management), and physician marketing. He led the turnaround of a distressed facility and launched three start-ups; securing more than $3 million in funding. In the insurance vertical, he served as VP of Strategy for Corporate One Benefits, an employee benefits firm, consulting with fully insured and self-funded employer groups to develop and implement healthcare cost management and patient/employee engagement strategies. Dr. Dobrzykowski earned four degrees and certificates from the University of Toledo; a PhD in Manufacturing and Technology Management from the College of Business, a Graduate Certificate in Public Health Epidemiology from the College of Medicine, an Executive MBA, and a BBA in Marketing. He is an Associate Professor with Tenure in the Department of Supply Chain Management in Rutgers Business School – Newark and New Brunswick at Rutgers, The State University of New Jersey. He teaches MBA courses in Healthcare Services Management, Operations Analysis, and Project Management and serves as Founding Co-Director of the Masters of Healthcare Services Management degree program, and the Founding Director of the Rutgers Healthcare Empirics and Analytics Lab (R-HEAL).